In the current climate in which established airshows struggle to continue it's nigh on a miracle for a newcomer to survive and yet Perth Airport saw the return of the Heart of Scotland Airshow, after its debut last year. Coming 100 years after the first Scottish international flight meeting in Lanark this year's show promised to also be an international event with representatives from those countries that attended the UK's second ever airshow a century ago invited and scheduled participation from two of those countries - France's Armee d'Lair and the United States' Air Force. 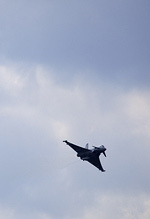 Andrew Dickie was there on the first of this two-dayer for UK Airshow Review. All photos by the author. 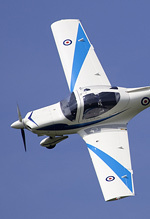 However, as with the best laid plans of mice and men (or women more accurately as the organiser was a well known name in the aviation community - Squadron Prints' Gill Howie) the international participation took a few hits in the run up to the show with the French Epsilon being replaced by a Grob 120 which itself had to cancel with less than a fortnight to the show - leaving just the flypast from the 100ARW KC-135R. That these participants were even confirmed in the first place, however, speaks volumes for the show and its organisers. Elsewhere RAF support was strong with Tutor, Hawk, Typhoon and GR4 all featuring in the flying display - the latter two being day specific. Those attending on the Sunday would have heard a blast from the past with Andy Pawsey on the commentary and a GR4 role demo in the air, whilst not able to compete with a full multi-type role demo it's certainly a step in the right direction (just a shame so many were taken in the other a few years back). Not in attendance where the Red Arrows as the delay in their pre-season build-up following their training accident meant Perth was a no-go, a big loss to a small show but unavoidable and given the circumstances everyone was just happy that Flt Lt Mike Ling was on the road to recovery. Another piece of RAF support, although not strictly RAF, was Richard Pargeter who, when he's not partaking in aerodynamic and gyroscopic shenanigans in his Pitts S-1S Special, flies the Tornado F3 with 111[F] Squadron just along the road at RAF Leuchars. 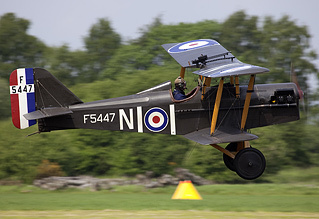 The flying display saw a number of Scottish regulars - the Duke of Hamilton's Bulldog, a Glasair II sporting centenary markings, a replica SE5a to name but a few - but this year's show also introduced a few new faces to the crowds. Breitling support of the show was in evidence through sponsorship and also with the attendance of some rather delightful young ladies in lycra - the Breitling Wingwalkers. To say their display used a bit of smoke would be an understatement of, dare I say, epic proportions. Coinciding with a period of still air the Stearmans went up to do a display which at times seemed to resemble scenes from a black and white WWII naval film - every once in a while a shape would appear out the 'fog' but before you could 'shoot' it it'd have slipped back into the soup. Futile to the point of hilarity from a photographer's perspective but a good close display nonetheless. Air Atlantique were north of the border providing pleasure flights throughout the day in their de Havilland Dragon Rapide and another of their 'classics' was in the air, Avro Anson WD413, returning to Scotland after some nine years with a display full of pleasing topsides. The Swift Aerobatic Display Team were also on hand to continue their, arguable, dominance of the civilian display market. Their display is excellent as a whole but it's impossible not to single out Guy Westgate's solo in the Swift S-1, a case study in energy management and apparent lunacy - who on earth tailslides a glider at that height? A display well worthy of the applause it received. Just as Duxford has its Balbos and Yeovilton its Commando Assault, Perth has its very own signature piece with the 'Balloon Bursting'. Nearing the end of the programme a gaggle of Tiger Moths, Chipmunk, Cessna, Bulldog, Pitts S-2A and SE5a chattered along the grass and positioned themselves for their stream launch. For the next 20 odd minutes this assorted mix of light aircraft took it in turns to unleash their props on the unsuspecting red balloons floating innocently skywards. There's no easy way to say it but it was a massacre, the lives of tens of helium-filled orbs were cut short, some did escape the onslaught - one evaded the spinning jaws of death only to be toyed with by the horizontal stabiliser as it dragged it for a while before losing interest with its prey and popping it - but for the vast majority it was off to the great recycling plant in the sky as their corpses were unceremoniously picked from the runway. With their foes defeated it was time for these aerial gladiators to return to ground and a bottle of whisky for the 'Alpha pilot'. "Are you not entertained?". Yes we ruddy well were! During the lunch period Andy Pawsey was joined in the commentary box by Peter Vacher, owner of Hurricane R4118 - the only surviving Hurricane with Battle of Britain pedigree and an aircraft that is no doubt going to be invoked frequently in this 70th anniversary year. Peter gave a fascinating insight into the history of R4118, including of course its local connection with 111[F] Sqn, and it was his warbird that would bring a close to proceedings. 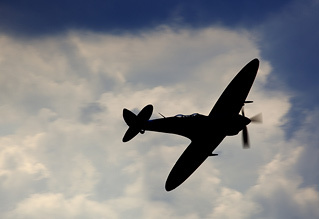 A few hours later and with Merlin III and Elgar harmonised, Keith Dennison displayed the veteran Mark 1 Hurricane in the greying skies before Lisa Gerrard's Aria accompanied him back to terra firma. "I was proud and honoured to organise the second Heart of Scotland Airshow at Perth Airport. As you can imagine it is not easy to stage an event such as this. The resources, assistance and financial support to set this event up is a constant uphill battle and in these economic times it becomes harder every year. Through the support of Morris Leslie, ACS Aviation and the Scottish Aero Club the event was backed from the start and to this end I have to thank them publically. Perth and Kinross Council Department and the Emergency Services have all offered advice and support from the very start and that too makes it a pleasure to work with them!" In spite of the last minute cancellations and the weather trying it's hardest to scunner the days the organisers deserve praise for pulling off a successful airshow. New airshows are few and far between in the UK let alone Scotland so to see the second 'Heart of Scotland' at Perth was a welcome sight indeed. Haste ye back!